Last year I purchased a new to me 22 foot Almar sounder with a 200 HP inboard outdrive set up. Since the outdrive and motor were pretty much corroded to death I decided to pull the trigger on a repower. I had the motor pulled out and then brought the boat over to a local boat builder to work with them on designing and installing a bracket and all the other customization's that I wanted like a fish box in the big hole in my deck, a few shelves to mount pumps, and the cover for the inside of the transom with some doors for easy access to my batteries and pumps. For power I purchased a new Evenrude ETEC gen 1 200 HP outboard from a local shop that will install it when the aluminum work is completed in a few weeks. This is the first welded aluminum boat I have ever owned and the process of repowering and redesigning it is awesome! I can't wait to get her on the water. Here are some pictures of the boat when I first bought it. Here is the stern in the process of being cleaned off, we took off the old kicker mount, the old swim platform, and the paint to get it ready for the new bracket. Here is the stern ready to go to the shop for the bracket installation. Here is the deck and old engine area ready for the shop, we are going to put a big fish box in there with a macerator pump out and a raw water washdown pump. Last step was to fully drain the gas tank. It is at the shop now and I am waiting to get CAD drawings back to review before they start making the changes. I will post pics once it is back from the shop and then again when the motor gets installed and I start putting it all back together. Here is the new fishing deck with the fish box and new transom cover. The fish box will actually open from front to back and is shown this way so you can see the new transom cover. The new fishbox and inside transom with hatches. Went by the shop today and took a few pictures of the work being done by Allied Boats in Bremerton, they are a bit behind schedule but doing great work. They tell me they'll be done by the end of next week and I can hardly wait. We did have to modify the design of the bracket to accommodate the motor, it is a 25 inch shaft and the builder recommended I either get the shaft extended to 30 inches or that we put a dip in the bracket and I chose the dip in the bracket. Here is where the new fishbox will be, they cut the edges and the motor mounts and are moving the fuel filter mount. You can see the fuel tank there on the right, which I'll clean before I put the plate back over it. I should be picking the boat up at the end of next week and will take it home to put the electronics back together and get it ready for the motor installation at Kitsap Marina. Woohoo! Well, big disappointment today because the boat is still not ready! Looks like another week until Christmas...but I did go by the Allied boat shop today and get a few pictures to share. The bracket is done, the swimstep is almost done and they have a good start on the inside work. They still need to finish the deck work for the fish box frame, the fish box, the cover for the fish box, the side panels for the back wall, and put the doors on the back wall. So check it out, here are two shots of the completed bracket and swimstep. Here is a closeup of the swimstep, I really like the little support bracket they put against the boat but they still need to weld the handle on. Here is what the inside of the boat looks like, I really like how the back wall of the transom looks like it and on the right they added a plate for the battery switch, a shelf for the oil tank in the middle and a shelf for a macerator pump for the fishbox there in the middle. So I am stuck waiting another week to think about the boat and probably buy more stuff to put into it when I get it back. One thing to consider when going to repower to outboard is weight distribution. Changing a 900lb I/O for a 400lb ouboard will offset the centre of gravity a bit, but if you are going to fill that I/O void with ice and tuna then you are good to go. I brought her home from Kitsap Marina today where they installed the new outboard, here is a picture of the boat with the motor on it. I am going to be finishing her up over the next few weeks and will post more pics as I complete it. When we put her in for the test drive she was tippy, something I was worried about since we removed some 1500 lbs of motor and replaced it with some 450 lbs of motor, and am wondering if anyone has faced similar problems with a repower and if so, could you offer some advice? Also should note there was only five or ten gallons of gas in her and no gear for the test ride. I'm thinking I might have to add some ballast, maybe lead bricks, concrete? harcher, please go slow on a re-balance and ballast? You won't want to add ballast if it's not needed and until you feel the boats roll moment (side to side) with some real loads- I'd caution that adding ballast, now, was premature. Swapping out engines, going to an outboard leg - mounted aft and not the larger mass inside -and forward of an inboard- is bound to make her feel "tender" (rolling side to side) but I'd say wait until you've loaded her with various added - fuel- crew- ice- gear - and on-and-on until you have some time running the hull with your new modifications. THEN, after some time running the boat you'd be much better informed if you need to add ballast or make other trim and roll adjustments? Just my thoughts about making moves before the 'Fat Lady Sings'- so to speak. My repower is roughly similar to yours, I pulled twin Merc 4cyl I/O's and replaced with V6 Zuke on a non-flotation bracket. Assuming your fuel is on centerline you will notice a huge tipping reduction when filled up. I carry 115 gals and it sits in the water like a '58 caddy when full but gets light on her feet when I'm below 30 gals. Your deadrise might be a little steeper than mine, that also can make it a bit more tender. Like Kevin said get it outfitted and fueled and run it for awhile. Fill the new fish hold w/water to see the effect of that too before buying lead. I put her in the water this weekend with a full tank of gas, 63 gallons, to take your advice and run her around without ballast and see what is what. I took a good buddy along with just basic safety gear to see how she rides and rolls. We started at the dock by having me in the drivers seat and my buddy walking from the passenger side to the drivers side across the fishing deck and the boat rolled pretty hard, more than I was comfortable with! We tried the same experiment under way and the roll was alarming! Plenty of power with the new motor and as long as we each stayed on our side of the boat it rode and handled well. Went back to the dock on our own side of the boat where I had six 80 pound bags of concrete double wrapped in plastic bags ready. I put a blue tarp in my fish box (it isn't drilled yet so I didn't want to add water to it) and then put some of the bags in my shiny new fish box and tried the same experiment until she 'sits like a 58 caddy' and felt really stable, which took all 6 bags. Still rode well and still had plenty of power and I felt much safer and happier. I pulled the bags out when I got her home until I figure out what I am going to do long term, it seems like she needs more weight under the water line but I think more experimentation is needed. Here she is sitting in the water with the cement in the fish box. Next steps are to add the Lowrance VHF and GPS, the washdown system and clean up some of the electrical wiring and then refreshing the bottom paint. More pics of the internal welding work as well as my additions will be coming soon, thanks for looking. I just noticed in an earlier pic that it had huge trim tabs considering the size of boat which would indicate that something was up with the handling. Are you planning to put those back on? I cut them down a bit to accommodate the bracket but I think they are still too large because when I put them all the way "bow down" it really buried the bow! So right now I am using a very gentle touch when I use them so I think taking a few inches off each side of them is the right answer. 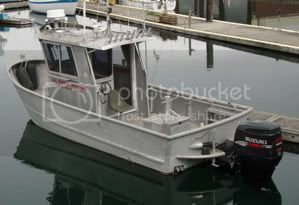 Alright, put her in the water today at Salisbury point and drove her up to Port Ludlow where she will spend the summer. I ended up putting 400 pounds of ballast in her which so far has been just what the doctor ordered. She was stable and handled very well, I have the GPS working and it told me I was going 30 MPH at 4200 RPM's with a full tank of gas, some of my fishing stuff and me. Right now I couldn't be happier! While the ride was only a few miles in good water I was super pleased at how well she tracked both while on plane and not. Can't wait to work out all the kinks, thanks for looking and I hope to see you out there. Congrats! You got a lot of work done in a hurry . . . ! This has been fun to read. Almar used to be built in Tacoma...I always admired the boats..unfortunately they closed before I bought an alloy boat. I may of had them build me one. Comment on big tabs: remember the 1500# and with your extended hull section you have a new tab sort of...the big tabs dealt with the heavy power unit and being shorter. On my Raider the extension is almost full width, in fact the bottom is all one sheet not an added on section. Your boat is looking sweet! FISHING REPORTS REQUIRED!!! I was going to add an image...but I don't have a host any longer OH WELL! Too bad I can't just drag and drop.